Taj Mahal Day Tour is a web extension of Companion Journey Pvt. Ltd. We operate private same day Taj Mahal Agra tours from New Delhi. Our day trips to Taj Mahal are daily available except Friday. Taj Mahal remains closed on Friday. One day Taj Mahal tour from Delhi is best for business travellers who can visit Taj Mahal on weekend. This day tour to Taj Mahal from Delhi is possible by air conditioned car via new Yamuna Express Way OR by Shatabdi Express superfast air conditioned train. Shatabdi Express departure time from Delhi is 06:00 AM and reach Agra at 08:05 AM. It's only 2 hours journey from Delhi to Agra. Same Day Taj Mahal Tour US$ 55 Per Person. Old & New Delhi Tour US$ 20 Per Person. Old Delhi Bike Tour US$ 30 Per Person. Delhi - Agra - Jaipur Tour. Goa Goa one of the smallest state of India by area and the fourth smallest by population is located in Konkan, a region of West India. Goa is the richest state of India with a GDP per capita two and a half times that of the country as a whole. Goa is visited by a large number of domestic and international tourists each year. It is renowned for its beaches, world heritage architecture and places of worship with rich flora and fauna, owing to its location on western ghats range classified as biodiversity hotspot. Goa is a popular destination for Eco Tourism in India. Pushkar Camel Fair Tour 2019 covering Delhi, Agra and Jaipur, Pushkar, Udaipur, Jodhpur is famous cattle fair tour in Rajasthan, North India. One can witness trading of cattles & camel in this world famous fair. We explore Taj Mahal one of the seven wonders of the world. Experience the history of massive forts, the splendour of Rajasthan's Palaces, the bustle of markets and bazaars, and traditional heritage home stay. Travel through a land full of contrasts on this hot sellable India Tour, packed with unforgettable monuments and Palaces. Day Trip Taj Mahal by AC Car Drive Through Taj Express Way US$ 110 inclusive of Monument Entrance, Lunch & Guide. 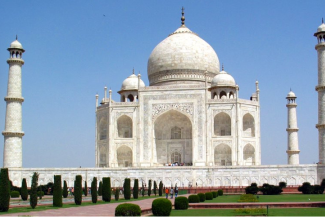 Taj Mahal Day Tour by AC Train Delhi - Agra - Delhi US$ 130 inclusive of Monument Entrance, Lunch & Guide.